COLOR: Light Colorado Topaz and Crystal AB Swarovski crystals, Gold Plated Crystal AB Swarovski crystal spacer beads, 14K Gold-Filled Nugget, chain and clasp. 24k Gold Vermeil Charm*. 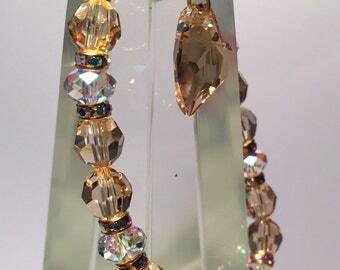 SIZE: Crystals are 8mm. Gold-filled nugget is 10mm. Length is adjustable from 6.5" - 7.5" with chain and clasp. Stretch cord for ease. 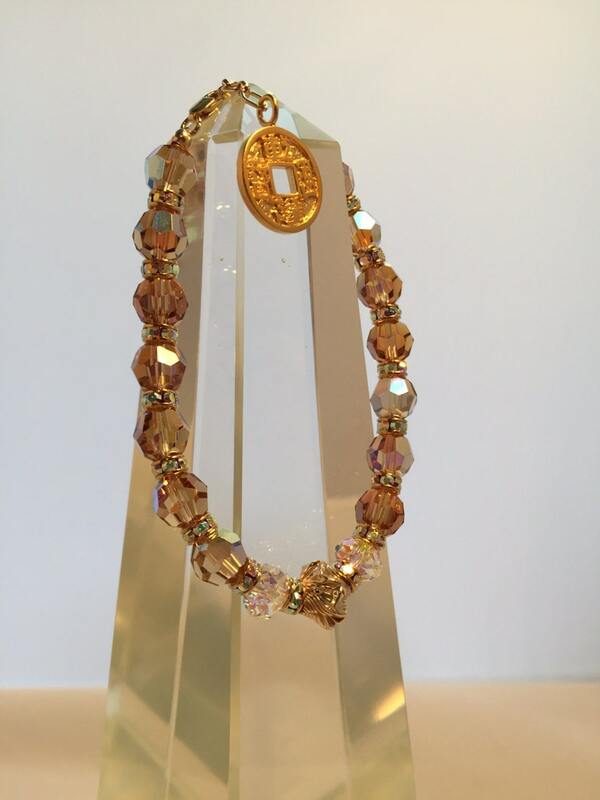 Everything about these Swarovski crystals and coin charm shouts PROSPERITY!! From the rich gold color crystals to the "diamond" crystal spacers, the gold nugget and the gold Chinese coin charm that symbolizes wealth and abundance, everything has been chosen specifically to carry the energies of PROSPERITY & ABUNDANCE. But just the design wasn't enough: all components have also been energetically cleared and infused with sacred energy to become your direct link to the Divine, so that you will continuously receive all the energies of Prosperity & Abundance that you are ready for, and exactly what YOU need. PROSPERITY is being successful at your endeavors - it is thriving in all aspects of your life. It is not solely about financial wealth, which is a limiting belief, but about everything in life. The blessing of these crystals will help you to discern those places in your life where you hold limiting beliefs and points of view so that you may release them. Transforming beliefs about prosperity opens the doors to all that the Universe can shower upon you so that you may thrive and be “wealthy” in all things. ABUNDANCE is a profusion of life - it is all that God can lavish upon you. You have the capacity to receive abundance in everything in life; love, relationships, self-worth, money, creativity, talents and abilities, etc. All things are abundant. This blessing will assist you in letting go of the judgments and points of views that keep you from allowing God and the Universe to shower you in extravagance. These jewels have been programmed to adapt to your individual needs, and will continuously receive unlimited sacred energy. The energy will never "wear out," and the jewelry will not absorb any negative energy, so it never needs to be energetically cleared. If at any time in your journey, you are knowing or sensing that you are not experiencing all that is possible, you can choose in every moment to release the blockages and allow yourself to receive. PLEASE NOTE: We are co-creators with God/Universe/Creator/Divine Source... in the production of these jewels. We clear, assemble and infuse the bracelets. God supplies the energy and the potential. Our intention in creating these jewels is for them to bless and enhance your life. How that manifests for you is in accordance with what you will allow yourself to receive, and between you and God. Crystal Vibrations Jewelry is not intended to replace conventional or holistic medicine or therapies, but rather to complement and enhance them. 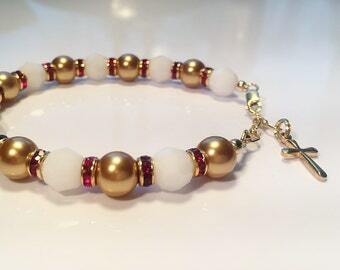 These bracelets and our guidance is not to be used as a medical or psychological diagnosis or treatment. Crystal Vibrations Jewelry can be used as part of a holistic healing therapy. By using these bracelets and jewelry, you acknowledge that you understand and agree that you are responsible for your own health and treatment. *Vermeil style charm is heavy 24k gold layered over sterling silver. Beautiful quality crystals. Fast delivery. Will definitely order from CrystalVibeJewelry again. I have been wanting this since 9/2013! I finally got it! I am already starting to feel more confident and happier. Should your bracelet ever require a repair, you can return it to us for repair or replacement. During the first three months, we will even cover shipping costs. All orders are shipped via USPS and insured. Everything has a consciousness, so please always give gratitude and love to your jewels. Treat them with respect, give them an occasional bath in warm water with a mild hand-soap and rinse in clear, cool water. Never wear them while doing chores or working with chemicals such as hairspray, cleaning products, etc. Due to the unique process to energetically clear and infuse the blessing into your bracelet, you should never need to do an energy clearing, as with other crystals and gemstones.